Halloween is a celebration of the dead, and darkness, but light is everywhere, from lit pumpkins to candelabras. Your child can make her very own jar light that will shine bright throughout the night! Ask your child to paint the entire surface of the recycled jar using orange tempera paint. Allow the orange paint to dry completely. 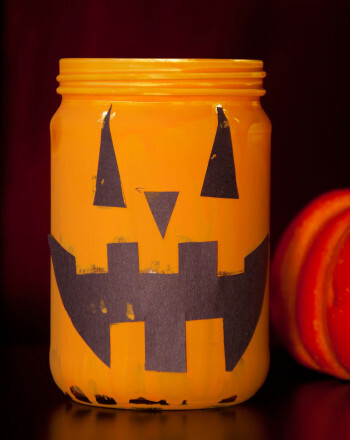 Encourage her to use a small brush to paint a jack-o'-lantern Face On one side of the jar. Fill in the line painting with black paint. Allow the paint to dry. If your jar is going to be displayed outside, fill it halfway with sand so it remains stable. Put a tea light in the bottom of the jar and help her light the candle. Place your light somewhere where it'll flicker all night long! Helpful Hint: Instead of sand, you can fill the jar halfway with water, take the tea light out of the aluminum base and float the candle while it is lit. This will help keep clean up simple and it'll be easier to light the candle as it'll be closer to the rim of the jar. This Halloween story starter will help your child polish grammar, handwriting and spelling skills. Get into the spooky spirit with a Halloween story starter! 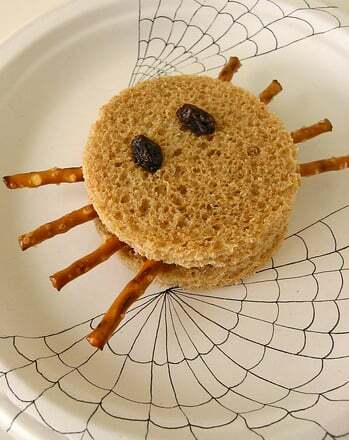 These Halloween sandwiches are a creepy-crawly treat for a holiday party or an especially scary school lunch. Make these Halloween sandwiches for your child. Imagine if the classic Christmas story, The Nutcracker, was actually a Halloween story! How would that change the way the story was told? Treat yourself to a tricky word scramble this Halloween! Your child can practise his spelling and vocabulary as he figures out each spooky word. Don't let grammar get ghoulish this Halloween! practise using punctuation with a spooky worksheet. Have fun with figurative language with these Halloween exaggerations that are sure to spook your students! Get ready for 13 Days of Halloween with this spooky countdown worksheet. Step right up, Halloween experts! This creepy crossword puzzle is jam-packed with spooky clues and maddening monsters. Can you crack this challenging puzzle?